Update 12/17/14: The Ferro Kickstarter campaign is live, http://kck.st/1zFw10s. 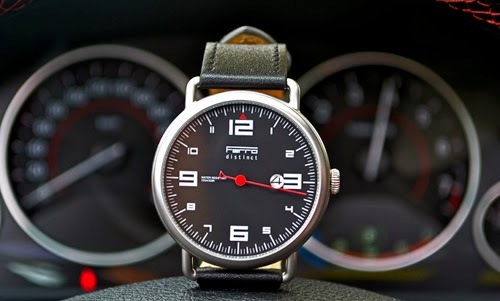 From Vancouver, Canada comes Ferro Watches. The company’s first offering will be the Distinct, a sports car inspired, single-hand model currently in development for a Kickstarter launch. Ferro’s founder, is currently soliciting feedback on his design and funding campaign, and as an added incentive, he will give away one watch to a random participant. The watch has a large, round, stainless steel case with a brushed finish, rounded sides and a wire lug design. It will feature a domed sapphire crystal and a Swiss Ronda quartz movement. Water resistance will be 100 meters. The case back and crown will be decorated. 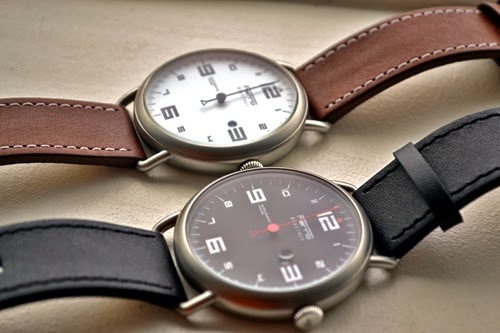 The watches will come with 22mm leather straps with signed buckles. The sports car influence is apparent in its bold, instrument style dial, intended to mimic a tachometer. Large Arabic numbers are printed in a heavy, square edged, sans serif font, oversized at 12, 3, 6, and 9. The hand is a needle and looks particularly nice in red against the black dial. A 5-minute index rings the dial. It is a simple concept that is nicely rendered. The brand’s name and logo pay homage (maybe a bit too much homage) to that of a certain Italian sports car company. The dial will be offered in off-white with a brown strap, black with a black strap, and a third color to be chosen by survey. Ferro is listening to potential customers, and have already made changes to improve the watch. The watches pictured are the original prototypes, but changes for final production include reducing the case size from 46mm to a more wearable 44mm, moving the date window from its crowded 3 o’clock position to 4 o’clock, and shrinking the crown from 7mm to 6mm. Prices will start at $225 CAD (@ $200 USD) for Kickstarter early birds. As I always say, there is nothing certain about a crowd funded project, but if you are interested in this affordable one-hander, and would like to add your two cents to the design and campaign, check out the Ferro Kickstarter preview page for more information, giveaway details, and to weigh in with your thoughts. Who knows? You might even win a watch.